The Free Bob Reyes Movement, a network consisting of progressive groups Karapatan, Bagong Alyansang Makabayan Quezon City and Sandigan ng Manggagawa sa Quezon City, held a protest action demanding the release of detained union organizer, Juan Alexander ‘Bob’ Reyes in front of the Quezon City hall of Justice today. Reyes, 48, coordinator of Sandigan ng Manggagawa sa Quezon City and a former organizer of government employees was illegally arrested June 2 last year while on his way home from a meeting with workers from Quezon City. He and his companion were forcibly taken in a vehicle by four men, blindfolded, with a gun and a detonation cord was allegedly planted on his small pouch. His companion was left off on the way with the abductors saying he was not the target. Reyes’ companion was the one who alerted rights group of the arrest. Reyes’ whereabouts were unknown for almost 12 hours until he was surfaced in the CIDG Detention in Camp Crame. 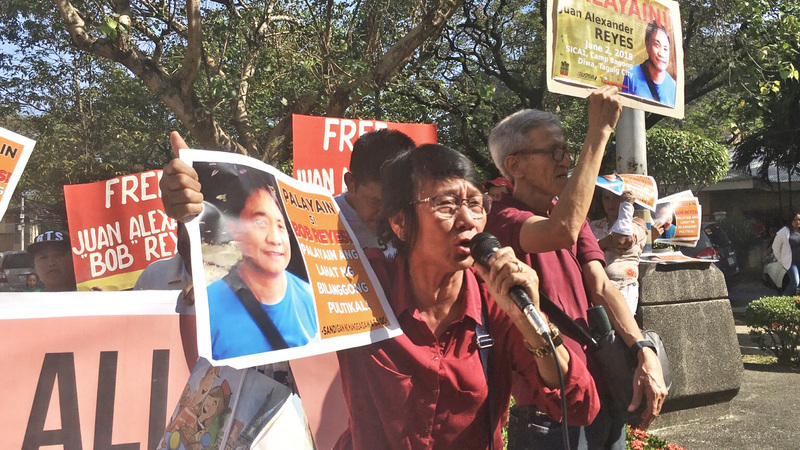 The group noted that, like other political prisoners arrested within the last year, the cases filed against Reyes such as “illegal possession of firearms” was made through planting of evidence. On January 15, National Democratic Front of the Philippines (NDFP) consultant Rafael Baylosis, 69, and consultant Roque Guillermo, Jr. walked free after of charges of illegal possession of firearms and explosives against him were dismissed. He was arrested in Quezon City in January last year. The defense lawyers of Baylosis and Guillermo from the Public Interest Law Center (PILC) had found the police story “incredible, unbelievable and bore hallmarks of perjury.” The police insisted that the accused were roaming through Manila and Quezon City with guns tucked in their waists and toted around a bag of red rice with a grenade inside. PILC added that the dismissal of Baylosis and Guillermo’s case proved not only his innocence, but also exposed the police’s conduct of illegal arrests, planting of evidences and filing of trumped up charges against peace consultants and political activists. Other offenses such as murder, frustrated murder and arson are charged against consultants and activists arrested by joint operations of the police and military—charges without bail that ultimately aimed to disrupt the lives, work and organization of those arrested, but would later also be revealed untrue. NDFP consultant Eduardo Serrano was acquitted in a multiple murder case in November 2015 for the failure of prosecution to identify him as “Rogelio Villanueva”. Serrano, who languished in jail for 11 years, died in detention in January 2016 due to cardiac arrest. In November last year, President Rodrigo Duterte announced that death squads will be formed as a response to “sparrow units” of the New People’s Army (NPA). The urban-based “sparrow units”, however, have been defunct since the early 1990s according to the rectification documents of the Communist Party of the Philippines (CPP). Also that same time last year, Duterte formed a task force for the purpose of ending the communist insurgency of the CPP, NPA and NDFP through Executive Order 70. The group called for intensified resistance to the increased attacks of the Duterte administration against the people since “they have no option left” but to oppose these repressive policies and actions of the government.